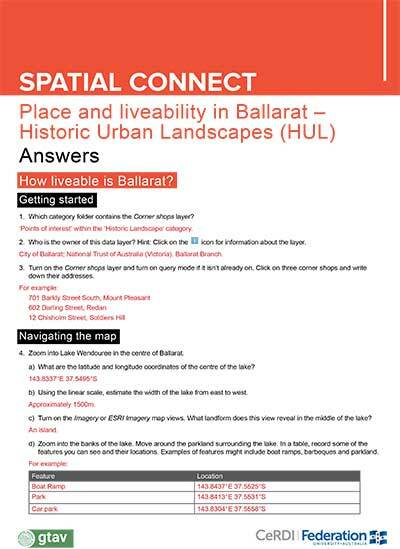 Spatial Connect is a project undertaken by Federation University Australia’s Centre for eResearch and Digital Innovation (CeRDI) in partnership with the Geography Teachers Association of Victoria Inc. (GTAV). 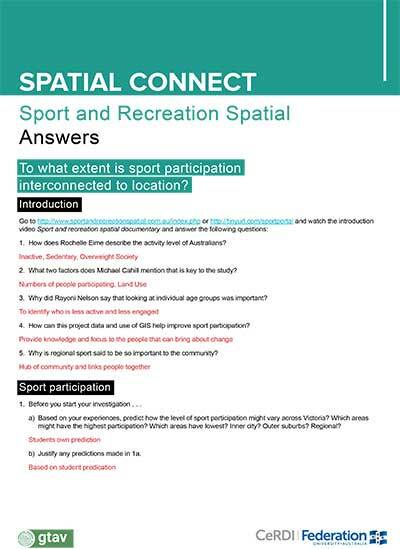 To access the Spatial Connect Learning Resouces, follow this link. 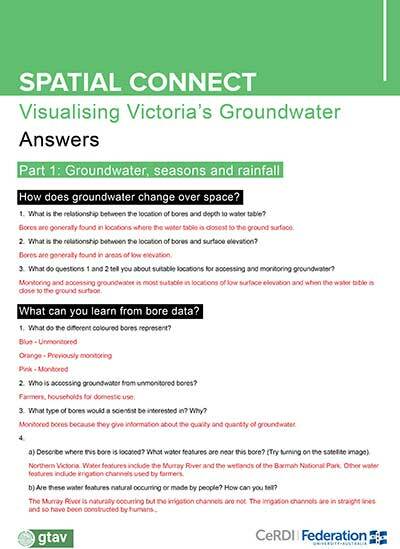 Spatial Connect involves the development of curriculum resources to embed the application of spatial technology across the primary and secondary geography and science curriculum. Curriculum resources will be linked to real-world knowledge sources across agriculture, environment, geology and hydrogeology, urban planning and natural disaster planning and recovery. The online elements will enable specific targeting to maximise educational opportunities for those who currently have limited potential for online access as it has not previously been an embedded part of the curriculum. These students have been found to be at a disadvantage in pursuing opportunities outside of the classroom setting, often as a result of socio-economic constraints which limit their capacity to access technology. It will also increase educational opportunities for those in rural and regional locations, particularly given the increased broadband access via the National Broadband Network. The project will build skills in the application of spatial technology, mapping and the use of big data within the context of contemporary issues. The use of comprehensive, up-to-date, real-world knowledge resources will enable students to build their understanding of industry, social, community and environmental issues. Crowdsourcing and citizen science capabilities will ensure the bridging of the theory-practice link. The Spatial Connect project focuses on the geography and science curriculums thereby capturing a strong science, technology, engineering and maths (STEM) focus. Access to sophisticated digital technologies (applying visualisation, data federation and interoperability) will allow students to gain new knowledge and skills through the use of real-world applications developed in collaboration with the scientific community, industry and government. 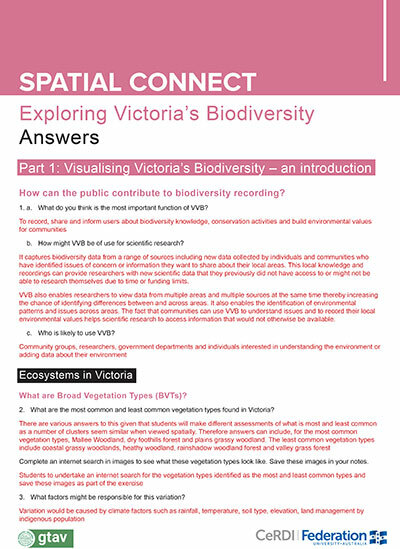 Spatial Connect knowledge partners will include Grains Research and Development Corporation, Landcare networks, environmental scientists, hydrogeologists, water authorities, Waterwatch, EstuaryWatch, local government, natural disaster planning and recovery initiatives in areas including fires, landslides, floods and climate change, State Wide Integrated Flora and Fauna Teams and Visualising Victoria’s Biodiversity. 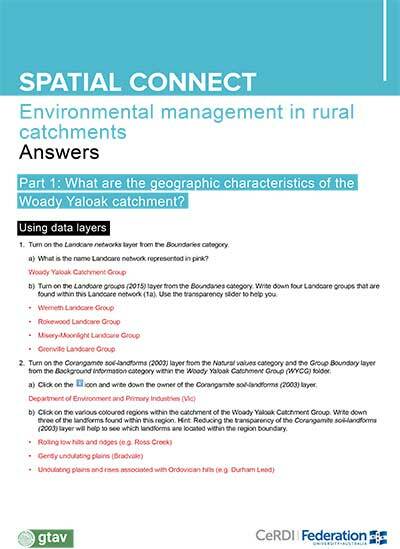 The Spatial Connect activities and answer sheets are listed below. To download any of these learning resources, scroll down to the 'Activities' or the 'Answers' sections below, then click-on (select) the learning activity that you would like to download to begin the download process. 1. 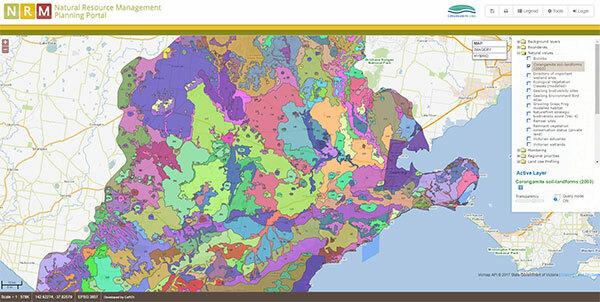 Interpret data in a visual form using a Geographical Information System (GIS) and develop appropriate conclusions. 2. 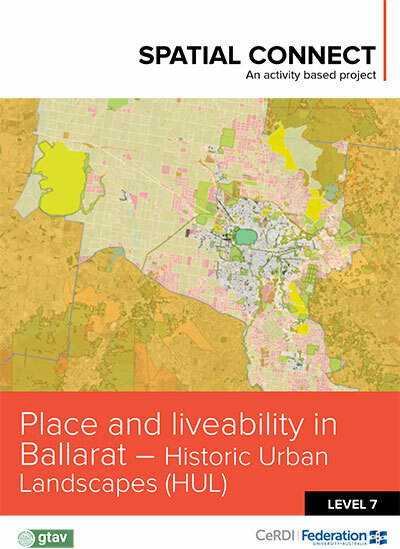 Assess the liveability of Ballarat using a variet of appropriate criteria. Teachers are encouraged to choose which activities to use with their classes. 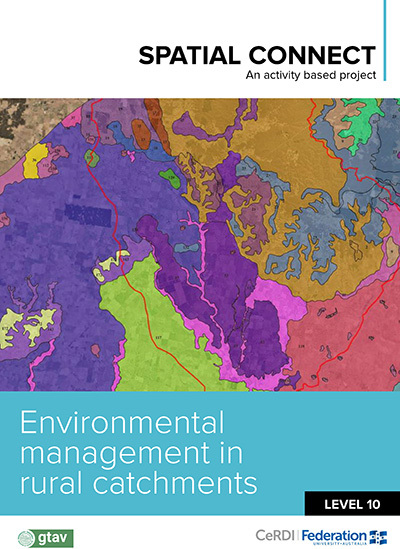 2. explore the various environmental management projects undertaken by local scale catchment management groups. This activity is appropriate for both levels and topics. 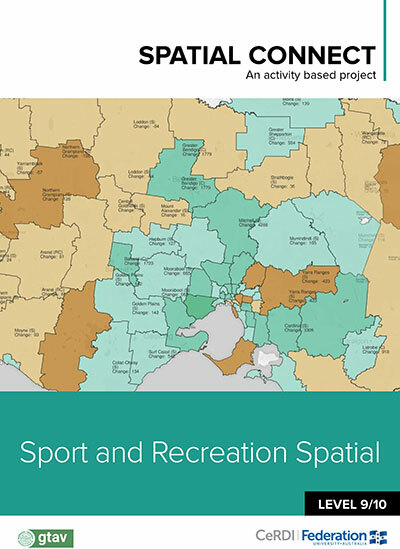 The interconnections investigated link with sport participation not only link into the Level 9 Geographies of interconnections unit, but by comparing with socio economic and wellbeing data it addresses many criteria of the Level 10 Geographies of human wellbeing. This activity would work perfectly as a linking task towards the end of Year 9 prior to Level 10 content. produce Scatter graphs to look at correlations between geographical factors. To what extent are the number of sports facilities interconnected to the level of participation? Which age groups/genres have the highest and lowest participation rates? 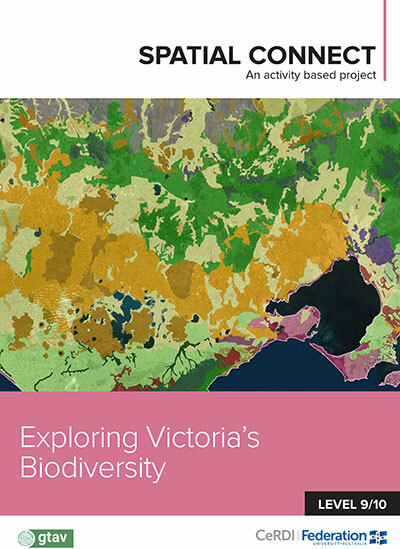 Where future investment in Victoria is most needed? This may vary in terms of number of extension activities completed and level of groups. 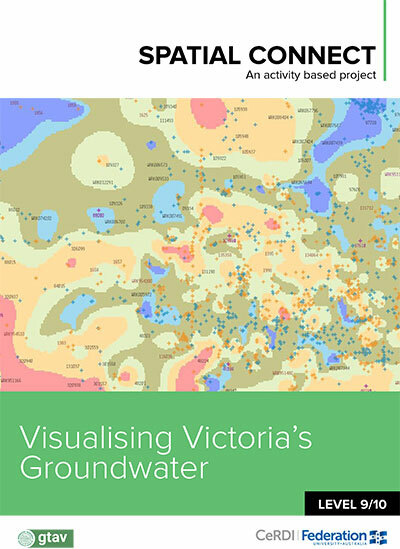 To promote understanding of the natural and human dimensions of groundwater through the use of spatial technology in a real world context. appreciate that the application of a Geographic Information System (GIS) can be useful for scientific research. 1. Appropriately employ a spatial technology (GIS) in Geography. 2. Interpret data in a visual and numerical form, provided via a Geographic Information System (GIS). 3. 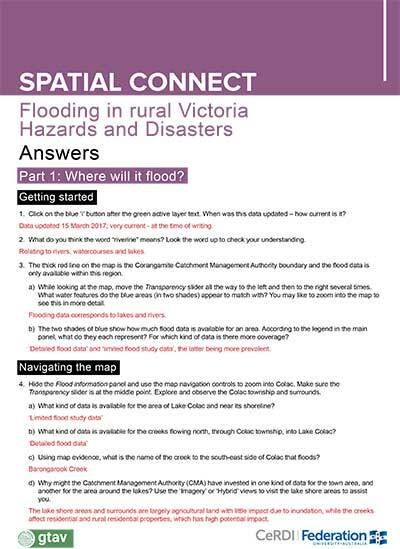 Use a range of geographic skills, including observation, map and data interpretation and analysis, to investigate a flooding hazard and relate this to real-world examples and situations. 4. 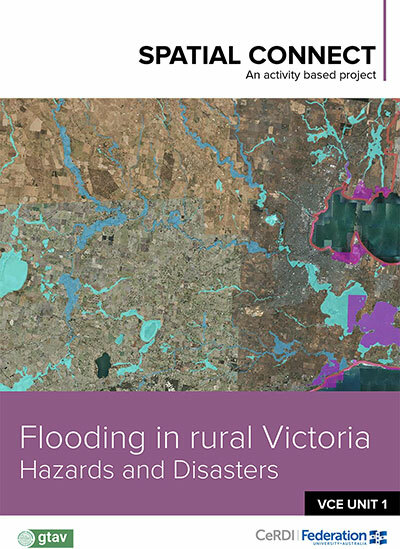 To use GIS-based flood modelling data to predict and visualise the likely impact of a 1 in 100 year (1%) flood on locations in a catchment on properties. Geography Teachers Association of Victoria Inc.